Great Service from Thrimana! Our engineers at IgniterSpace are currently using your printers to experiment with creating many cool robotics projects. Very friendly & courteous staff. Great job! 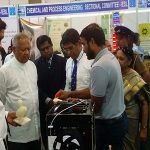 The Department of Computer Science, University of Sri Jayewardenepura, would like to extend our sincere gratitude for the excellent support given in manufacturing the first social robot in Sri Lanka by your reputed company, RCS2 Technologies. We are amazed by the precision and quality maintained by your own brand of Thrimana 3D Printers which was used to print the social robot. Their Thrimana 3D printing technology was successfully used create a physical 3D model of the Jethawanaramaya stupa which was scanned and converted to a 3D point cloud with CSIRO’s Hover map technology. 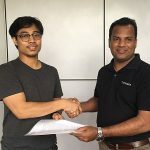 I am looking forward to working closely with RCS2 Technologies and their dedicated team for Phase 2 of this project where we intend to do this at a much larger scale. I have no doubt that their technology and team will rise to the challenge and deliver exceptional results.